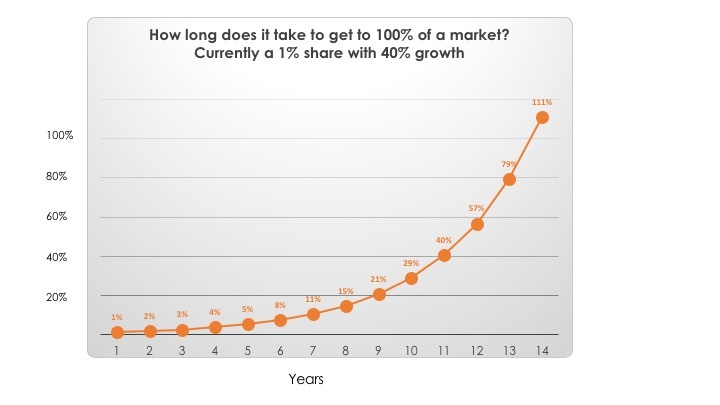 Moreover, even at 10% market share it is all too easy for us to think that the innovation can be ignored. It is still a small fraction of the available market and another human weakness - complacency - allows entrenched competitors ignore the pace at which their market is being undercut. The old technology may still be growing in absolute terms even as the upstart gains 10% share, encouraging a comforting sense that all is normal. The novelist Ernest Hemingway has one of his characters ask another ‘How did you go bankrupt? ‘Two ways’, was the response “gradually and then suddenly.’ The competitors in the old energy economy, dominated by fossil fuels and internal combustion engines, are still mostly in the ‘gradual’ phase of their bankruptcy. The ‘sudden’ phase may arrive much sooner than they imagine. The best known example of the how explosive growth transforms an entire industry is, of course, the arrival of the digital camera and its impact on conventional photography. Kodak, the dominant global producer of photographic film, can lay claim to having invented the digital camera in 1975. The company doesn’t appear to have actively commercialised the product and it was Sony that bought out the first consumer device in 1981, although this was an electronic, but not fully digital, camera. Just five short years later, the conventional camera was all but finished. Agfa, the leading European photographic film manufacturer, went under in 2005. The delusions of those backing this company persisted well after others knew that the death knell for film had sounded. Just nine months before the final closure, its owners said that ‘Agfa Photo will continue to play a leading role in the photographic industry’. It had descended ‘gradually and then suddenly’ into bankruptcy after ignoring the threat from digital. Konica stopped producing film in about 2006. Kodak struggled on until 2012, kept alive by a wider range of products. Think of some of the key building blocks in the process of transition to a low-carbon economy: offshore wind, solar PV, electric vehicles and storage batteries. All of these technologies are still only insignificant fractions of much larger markets. Many people therefore believe they will still be immaterial for decades to come. Unlike Fuji, all the major oil companies - possibly with the exception of Total - are in denial about the possible speed of transition away from fossil fuels. The crucial thing for us to understand is that at fast growth of a new technology undermines the old companies in an industry more quickly than human psychology allows us to believe. The story of how the major competitors failed to predict the advance of digital cameras will be repeated across many industries in the next two decades.